Julia Cartwright is a research psychologist and director of Flex Business Consulting Ltd. She has an expert knowledge in patient information and health communications and has worked as a strategic advisor to HealthQWest Scotland. She has also held research posts at The Picker Institute, The University of Oxford's Health Service Research Unit and Oxford Brookes University. She is a member of The Community Partnership Forum, The Better Healthcare Programme for Banbury & Surrounding Areas. Sally Crowe is a Director of Crowe Associates Ltd. She has extensive experience in providing consultancy, training and project management for patient and public involvement in health and social care research. She is a project consultant to the PRIME (Partnership for ME Research) Project, and the UK Prostate Link project. She is currently managing the development of a service user and carer component to the social care themed Log on to Care site and chairs the monitoring and implementation group of the James Lind Alliance, a national initiative that aims to tackle treatment uncertainties in health care. 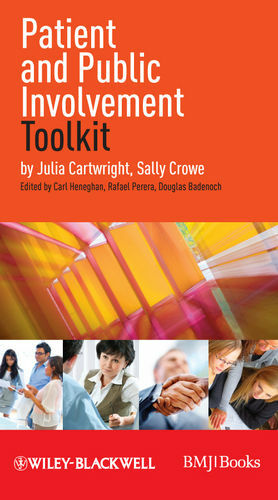 Why have a PPI toolkit? Chapter 2 What is patient and public involvement? Why is PPI growing in health and social care? How does PPI help organizations and services and care change? Developing an organizational strategy for PPI. Defi ne structures within your organization. Defi ne structures outside your organization. Four ways to develop PPI. Chapter 3 How to conduct effective PPI. Searching for literature about involvement. Searching the grey literature for PPI publications. Searching and citing issues in PPI. Designing a questionnaire for a survey. Running a focus or discussion group. Support and training for participants and professionals. Interpersonal skills: running effective meetings and workshops. Role of chairperson or facilitator. Dealing with diffi cult situations and managing conflict. Chapter 5 Evaluation of PPI. Evaluating PPI methods and process. Evaluating the impact of PPI on a service or project. Evaluating the impact of PPI on the people who took part. Chapter 6 The future of PPI. Allocation of resources and better use of resources. Health professionals working with patients and the public. Developing trust and credibility between the public and health organizations. Improving quality of care and reducing harm.